An interesting release in terms of content, but certainly not one for people who like their recordings of a high standard. The recording sounds like it has been recorded from outside the venue, and whilst there is not any distracting background noise which plagues releases of this sort (for instance the Act II Birmingham ‘Indoor Rehearsals’ release) it’s fair to say that only people with an interest in this era may find anything to rave about here. The opening 7 minutes is a horrendous cacophony of overpowering bass and treble which thankfully improves during ‘Thunder’ (instrumental) – the person recording can be heard moving to a better position, with much better results. The recording settles down for the remainder and whilst it isn’t exactly great, it’s audible and not bad considering the circumstances it was recorded in. It’s murky and the vocals can be rather hard to distinguish in places (for example the mysterious final track remains an enigma), but the band are at a decent level and it is an enjoyable set once your ears become accustomed to the less-than-stellar quality. Content-wise, it’s very different to the two other circulating rehearsals in preparation for the Diamonds And Pearls tour (‘Diamonds And Pearls Tour Rehearsals’ being one of many audio releases containing either) and whilst the main portion of the show is fairly rigid, there are numerous jams which really make the release more interesting than the other 2 rehearsals. A 6 minute (mainly) instrumental jam is followed by an instrumental version of ‘Thunder’ basically serving as Prince’s run-through for his guitar work. A few minutes of band chatter/samples follow before the show begins proper and the remainder of Disc 1 (out with various “Chicago!” shouts) is fairly straightforward. Likewise the majority of Disc 2 is as it was performed on the tour, however mention has to go to a superb 13 minute jam on ‘Gett Off’ with Prince reciting the lyrics to ‘Black MF In The House’ and stretching the song out to include various solo’s from the band – it’s very, very funky. In a similar vein, ‘Cream’ is extended slightly to include various lyrics from ‘Eye Wanna Melt With U’ including the “Yeah, do that baby just like a dog” and half the first verse. ‘Push’ is extremely lengthy lasting around 11:30 and not only has the usual portion of ‘A Love Bizarre’ added, but also an extended jam on ‘Outa-Space’ along with the “Contradiction my prediction is that..” rap from ‘The Flow’. A fairly pedestrian version of ‘Call The Law’ leads into the last 16 minutes which contains an unidentified track to me (and presumably to 4DaFunk too as it remains “unknown”). To be truthful, it actually sounds like 2 different songs performed – the first with Rosie on main vocals with the band repeating a phrase of “You give me good loving, yes you do”, and the second with Levi appearing to take control of proceedings before Tony M stomps all over it with “Get on my nuts and go hmmm” one too many times for it to be funny. Personally speaking, I enjoy this release for it’s content – not quality. There are numerous moments during the rehearsal which didn’t take place at the main shows, and it’s always a pleasure to hear the band cut-loose and just play. Quality-wise, it’s most definitely not something which will appeal to everyone (understandably so), but it is something which people with an interest in the sorely underrated Diamonds And Pearls tour will enjoy – if only for the marginal changes. 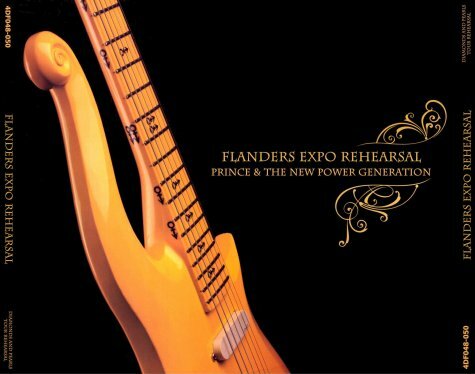 The European premiere of the D&P tour the following night is circulating on the ‘Flanders Expo, Ghent’ fan release.